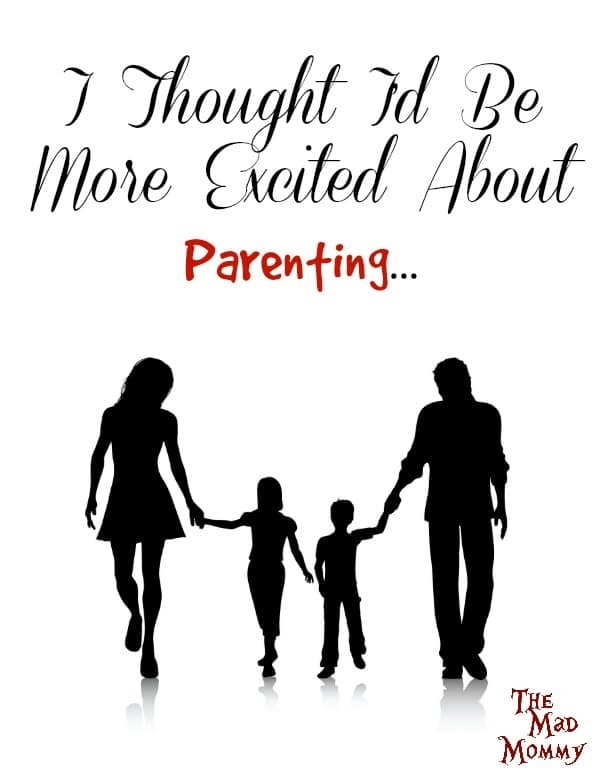 I thought I’d be more excited about parenting, but to be honest, it scared me to death. It still does. I am a terrified, anxious, Prozac-taking, peeing-when-I-cough mess and I think I always will be. Oh dear God, what have I done? I can barely take care of myself, physically and mentally, and now, I am going to have to take care of someone else. How the hell is this going to work?! I don’t know ANYTHING about boys. How am I supposed to raise a boy? Oh my god, I don’t know how to clean him, I don’t know how to dress him and I have no idea how I am supposed to teach him to pee standing up! I can’t even handle my own throw up, how am I going to handle someone else’s?! Seriously?! How am I supposed to keep up with him?! I am lazy and like to sleep. Why can’t he sleep? Why can’t I sleep? Please, just let us sleep! I barely survived the first one and now, I’ll have two! Why did I agree to this? What have I done? How can I take care of two lives?! A whole other level right here! It’s not even regular parenting, it’s like “epic level dungeon” type parenting. My crowning moment! They have both survived past 5 years old and are great kids that are occasionally assholes and that’s ok! At first I was afraid. Man, I was petrified, kept thinking I could never keep these kids alive and I’ve spent oh so many nights, thinking how I’ve done it wrong and I grew strong and it turns out, I could parent all along! I am linking up with Finish The Sentence Friday! Tell me, what did you think you’d be more excited about, but weren’t? OMG! I can identify with the “It’s a boy” response. I was 21 when I had my first born son. I got over the fact that I was being entrusted with a life quite quickly, and started day-dreaming about my baby girl and the shopping we’ll be doing together – only for the gynae to tell me it was a boy (I panicked because now I had to take care of this person who is the total opposite of me). Strangely though, the cycle repeated itself with my daughter. Now I’ll be singing “I Will Survive” all morning! I had a girl first, so my panic wasn’t about gender, just a general “OMG I have no idea what I’m doing. We all figure it out eventually, right? Or at least fake it. Love these! The boy and puke were the hardest for me. I have 4 boys and it was an adjustment for sure. The hardest part for me was the sleepless nights. Once they were over with, nothing seemed quite as bad! I thought it was just me. Being a mom is amazing but sometimes I feel a little disappointed. Echo! This is so so awesome! I lucked out with potty training Tucker as they pretty much did it for me at preschool 🙂 You did such an awesome job making a fun post for Finish the Sentence. XOXOO And yeah, I panicked a little bit too. Oh man, Natalie spit up SO MUCH. It was disgusting. I hated the lack of sleep with tiny kids. I’m one of those people who need 8 hours. Hhahahaha, this is funny, had my first child last year, a boy! It is crazy business but I love it all. I love this!!! It is amazing how you can have a thought how its gonna be but then how it really goes as a parent is crazy. Amazing. Can relate almost in all of them. I agree with Vera Sweeney. You can never know unless you become a parent yourself. OH MY GOSH! I’m pretty sure you’re my long lost sister! I feel you on every single point HA! ha! I love the GIFs. And the fact that I’m now singing “I Will Survive.” Pretty awesome. And yes, I thought I’d be more excited, or less excited, or better at it. Or something! I’m in the terrible 3’s right now and every day is a test. I was okay in the beginning but now I ask this same question. Can’t wait for it to pass! This is a hilarious take on parenting. Sometimes we never know what we asked for! My first pregnancy was about 19years ago. It was a scary stuff for a first time Mom but you can get by later on and it is everything exciting.